Peter Weckauf was born in Vienna in 1963 and started to learn Martial Arts when he was 15. He is certified in adult education and is an officially recognized and certified security expert as well as renowned self-defense instructor. He has taught courses in various European countries: Austria, Germany, Italy, Spain, Slovakia, Czech Republic, Finland, etc. Peter Weckauf is one of the most recognized authorities in both armed and unarmed self-defense. As head of AKMA (Austrian Krav Maga Association), Stick Fighting Concept Austria, Doce Pares Eskrima Austria and teacher of Jeet Kune Do, Panantukan (Philippine boxing), S.D.S. 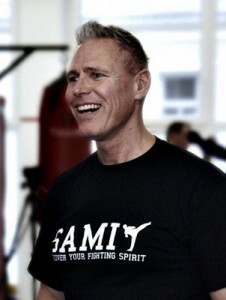 Concept and certified boxing instructor; he has 30 years of experience and extensive knowledge on the subject of self-defense and martial arts. His love and passion for martial arts have inspired him to make this concept available to a broader audience. He is currently teaching various courses and seminars to professional groups, Law enforecement, and private individuals. He is the founder of SAMI Knife Fighting Concept and S.D.S. Concept.